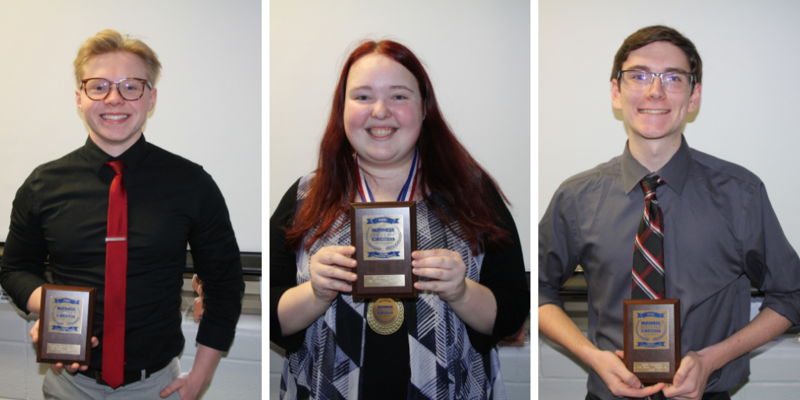 Eastland-Fairfield Career & Technical Schools’ Multimedia Satellite, located at Pickerington North High School, garnered five regional championships in the Ohio Region 14 Business Professionals of America (BPA) Competition. In all, the Multimedia Satellite had 18 seniors and 16 juniors receive one or more awards in the competition. The winners include students from Pickerington North, Canal Winchester and Gahanna Lincoln High Schools. The website design team (above) of Wyatt Rider, Michael Kelso, Lexi Nevin and Anna Stanley claimed first place in their competition, while the video production team (below) of Enrique Cabotage, Matt Ferguson, Julien Martinez (Canal Winchester High School student), Justen Turner won first prize in their competition. 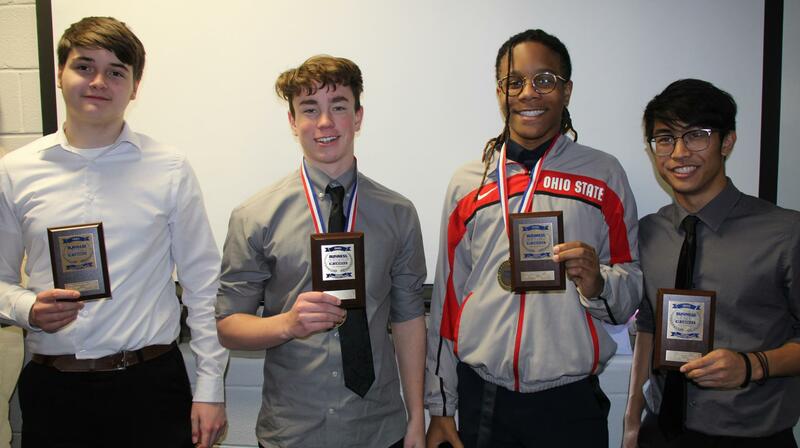 Both teams advanced to the Ohio BPA State Competition on March 14, 2019. Also advancing to state in individual contests are Rider (first place, Fundamentals of Web Design), Tye Hedderick (fourth place, Fundamentals of Web Design), Lily Woodard (Gahanna Lincoln High School student, first place, Entrepreneurship; third place, Integrated Office Applications), Kyle Mace (first place, Digital Publishing), Rachel Rector (second place, Desktop Publishing), A.J. Dinsmore (third place, Desktop Publishing), Lio Jara (second place, Integrated Office Applications). Pictured below are Rider, Woodard and Mace. BPA is the leading Career and Technical Student Organization (CTSO) for students pursuing careers in business management, office administration, information technology and other related career fields. The Ohio Association is the second largest state association within BPA with approximately 7,200 secondary and postsecondary members.